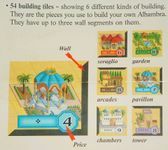 What are correct English terms for the different buildings in Alhambra? Pavilon, Manor, Mezzanine, Chambers, Garden, Tower. 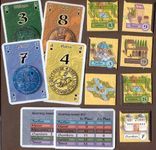 Pavillon, Seraglio, Arcade, Chambers, Garden, Tower. Manor is replaced with Seraglio, and Mezzanine is replaced with Arcade. Which is more accurate? In addition, Pavilon (which appears to be a Hungarian word) is replaced with Pavillon (a French word); I would have expected instead the English Pavilion? Interestingly the introduction the rules also mention "stonemasons from the north or horticulturalists from the south." Is the idea that each different building has its own master builder, eg the Garden is built by a horticulturalist? The "serail" is best translated as "harem"
And Arcades is a more direct translation for Arkaden than Mezzanine.